Despite the economic and political uncertainty in the recent past, the global healthcare industry has been receiving positive nudges from reformative and technological disruptions in medical devices, pharmaceuticals and biotech, in-vitro diagnostics, and medical imaging. Key markets across the world are facing a massive rise in demand for critical care services that are pushing global healthcare spending levels to unimaginable limits. A rapidly multiplying geriatric population; increasing prevalence of chronic ailments such as cancer and cardiac disease; growing awareness among patients; and heavy investments in clinical innovation are just some of the factors that are impacting the performance of the global healthcare industry. Proactive measures such as healthcare cost containment, primary care delivery, innovation in medical procedures (3-D printing, blockchain, and robotic surgery to name a few), safe and effective drug delivery, and well-defined healthcare regulatory compliance models are targeted at placing the sector on a high growth trajectory across key regional markets. PMR utilizes a triangulation methodology that is primarily based on experimental techniques such as patient-level data, to obtain precise market estimations and insights on Molecule and Drug Classes, API Formulations and preferred modes of administration. Bottom-up approach is always used to obtain insightful data for the specific regions. The country specific data is again analysed to derive data at a global level. This methodology ensures high quality and accuracy of information. Secondary research is used at the initial phase to identify the age specific disease epidemiology, diagnosis rate and treatment pattern, as per disease indications. Each piece of information is eventually analysed during the entire research project which builds a strong base for the primary research information. Primary research participants include demand-side users such as key opinion leaders, physicians, surgeons, nursing managers, clinical specialists who provide valuable insights on trends and clinical application of the drugs, key treatment patterns, adoption rate, and compliance rate. Quantitative and qualitative assessment of basic factors driving demand, economic factors/cycles and growth rates and strategies utilized by key players in the market is analysed in detail while forecasting, in order to project Year-on-Year growth rates. These Y-o-Y growth projections are checked and aligned as per industry/product lifecycle and further utilized to develop market numbers at a holistic level. On the other hand, we also analyse various companies annual reports, investor presentations, SEC filings, 10k reports and press release operating in this market segment to fetch substantial information about the market size, trends, opportunity, drivers, restraints and to analyse key players and their market shares. Key companies are segmented at Tier level based on their revenues, product portfolio and presence. Please note that these are the partial steps that are being followed while developing the market size. Besides this, forecasting will be done based on our internal proprietary model which also uses different macro-economic factors such as per capita healthcare expenditure, disposable income, industry based demand driving factors impacting the market and its forecast trends apart from disease related factors. Arthritis is a vast term, which includes an umbrella of 100 different types of arthritis, the most common ones being osteoarthritis (OA), rheumatoid arthritis (RA), psoriatic arthritis (PsA), fibromyalgia and gout. Rheumatoid arthritis is an autoimmune disorder in which the immune system of the patient’s body forms antibodies against synovial tissue—a specialized connective tissue. Loss of tissue lining causes friction in the bones and they tend to deform, which is called as rheumatoid arthritis. The treatment options available for rheumatoid arthritis are nonsteroidal anti-inflammatory drugs (NSAIDs), corticosteroids, disease-modifying antirheumatic drugs (DMARDs) and biologic response modifiers (biologics). However, these therapies do not cure the disease completely; they just put a halt on its progression. DMARDs is considered to be the most attractive therapy type in the market. This therapy is expected to witness the highest market value and growth rate during the forecast period 2017-2025. According to market projections, the DMARDs market is expected to reach a market value of over US$ 30,000 Mn by the end of 2025, growing at a CAGR of 6.2% during the forecast period. Conventional DMARDs is the most common therapy for Rheumatoid Arthritis. These drugs are available in different dosage forms including oral as well as parenteral; each dosage form having a different treatment regime. Biological DMARD includes biologic agents that are approved for the treatment of rheumatoid arthritis. Any biologic treatment that is not approved by the regulatory authorities or is under investigation is beyond the scope of this report. Many DMARDs are in wide adoption as a first-line treatment for rheumatoid arthritis, such as sulphasalazine, methotrexate and hydroxychloroquine. Major companies like Can-Fite BioPharma Ltd. are investigating several novel antirheumatic disease modifying agents that are expected to be available in the market in the next 10 years, uptake of which by prescribers and patients would push market growth. However, next-generation antibody therapeutics such as biosimilar antibody products represent high growth potential for the antibody market. Biological DMARDs are expected to lead the global market and witness a growth rate of 6.4% during the forecast period. Biologics for rheumatoid arthritis are proving better over conventional DMARDs and two out of three patients respond to this treatment. However, these drugs come with a huge price tag and can cost up to US$ 1,000 to US$ 3000 per month. During the last few years, there has been a steep increase in the cost of biologic therapy. For instance, since 2013, the cost of Enbrel has increased over 80%, which now costs US$ 4,000 per month. The cost of Humira has gone up 70% to approximately US$ 3,700 per month. Monthly treatment cost with Xeljanz has increased by 44% to reach US$ 3,100. These prices do not include discounts, rebates, or copay programs and even after discount, prices of these drugs are considerably high. Furthermore, there are several side-effects associated with biologic therapies. These therapies are immunosuppressant and long-term use may give rise to a variety of immune system related adverse reactions ranging from upper respiratory tract infections, sinusitis, pharyngitis, neutropenia, injection site erythema, urinary tract infections to more serious conditions such as cardiovascular events. 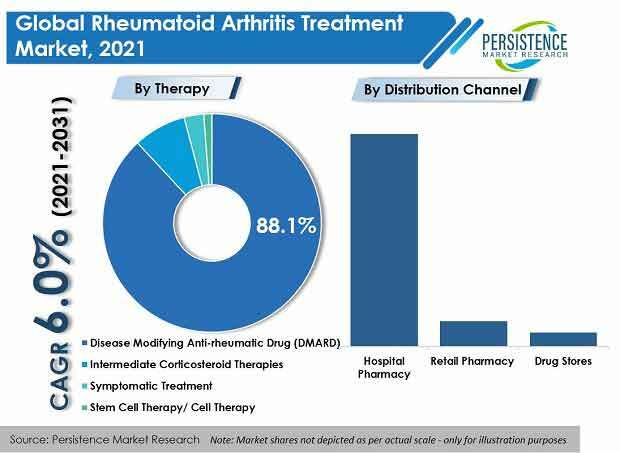 Such issues can be a major hindrance in the future growth of the global rheumatoid arthritis treatment market.